TWO ANTI-WAR activists appeared at Ennis District Court today charged with the criminal damage of a US navy aircraft at Shannon Airport last night. ‘Danger, Danger’ Don’t Fly’ was scrawled in red market on the aircraft. In court today, part-time university lecturer, Dr Ed Horgan (71) of Newtown, Castletroy, Limerick said that he will be pleading not guilty to the charge of criminal damage. Dr Horgan’s co-accused is unemployed man, Dan Dowling (35) of Grace Dieu, Waterford City and Judge John King today strongly urged both men to get legal representation. The charge against the two accuses the men of without lawful excuse causing criminal damage by defacing a US navy aircraft with graffiti. Speaking to reporters after the brief court appearance outside court, Dr Horgan said he handed in 35 pages of a list of 1,000 children killed in conflicts involving the US in the Middle East, Asia and Africa to gardaí at Shannon after his arrest on last night. The total list unfortunately is one million children since 1991. If you want my motivation, it is the killing of children in Iraq, Syria, Afghanistan and Yemen. Dr Horgan said that Gardai have retained a copy of his list. 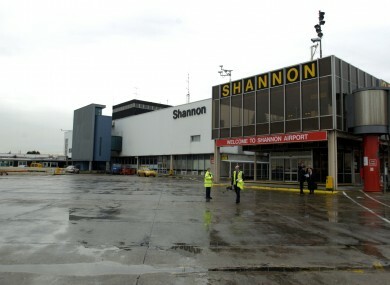 Dr Horgan said the actions at Shannon airport “were part of an informative protest – to inform the people that we are complicit and the gardaí are not searching US military aircraft and they should be. They are not doing their job and as a citizen I feel obliged to help them to do this. In court, Dr Horgan successfully argued against garda bail conditions that he remain out of Co Clare and sign on daily at his local Garda station. Dr Horgan said that he has no previous convictions of any sort and needs to go through Co Clare as part of his work as a part-time university lecturer. I see no reason why I have to sign on daily. After listening to Dr Horgan’s objections, Inspector David Finnerty told the court Dr Horgan remaining out of Shannon airport and town would be sufficient and that Dr Horgan can sign on once a week at his local garda station. Garda Carmel O’Malley said that she arrested both accused at taxiway 11 at Shannon airport at 10.40pm last night. She said that Dowling had nothing to say after caution and that Dr Horgan replied ‘not guilty of any offence’. Dowling said that the bail conditions to stay out of Co Clare and sign on daily were harsh. Judge John King said that if he breached any of the conditions, the gardaí could bring the case back before the court. Judge King remanded both men on bail to reappear before Ennis District Court for directions from the Director of Public Prosecutions on 7 June. Email “Lecturer charged with the criminal damage of US navy aircraft at Shannon”. Feedback on “Lecturer charged with the criminal damage of US navy aircraft at Shannon”.